The much awaited 2016 Champions League final is here as Real Madrid and Atletico Madrid will fight to lift the cup in a much anticipated Madrid derby on Saturday night. 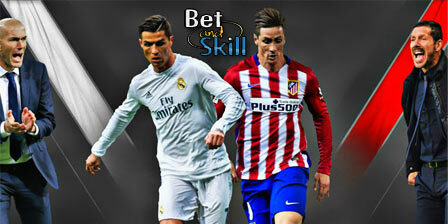 This article contains our REAL MADRID v ATLETICO MADRID betting preview with expert predictions, betting tips, enhanced odds, probable line-ups and no deposit free bets on the Champions League final. Real Madrid finished as runners up to Barcelona, just one point in arrears. They won 28 of 38 league games, drawing six and losing four with 110 goals scored and 34 conceded. The Blancos have had to overcome one major hurdle en-route to Milan. A 2-0 defeat at Wolfsburg left Zinedine Zidane’s men on the brink of crashing out in the quarter-finals, but a Cristiano Ronaldo's second-leg hat-trick that sent the Merengues into the semi-finals where they knocked out Manchester City. Locked away at 0-0 after their clash at the Etihad, Real came through in a tight affair at the Bernabéu with a dramatic 1-0 victory. Cristiano Ronaldo limped off the pitch during Tuesday’s training session but the Portugues start is expected to be fully fit for the final. Raphael Varane will miss the final and Euro 2016 with a thigh injury. Otherwise Zinedine Zidane can select his strongest XI. Gareth Bale and Karim Benzema will partner Ronaldo upfront while Casemiro, Luka Modric and Toni Kroos will start in midfield. 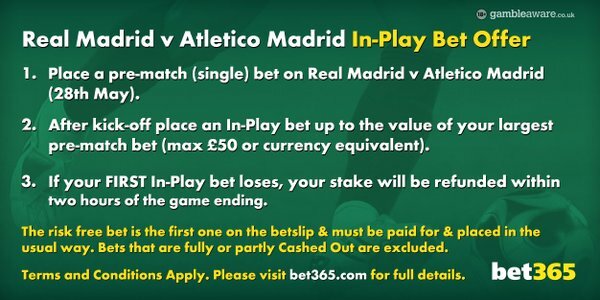 Claim here your risk free £50 in-play offer Real Madrid v Atletico Madrid, plus a first deposit bonus of up to £200. Atletico finished third in the standings, three points adrift of champions Barcelona and just two behind Real. They won 28 of 38 league games, drawing four and losing six with 63 goals scored. They have overcome two world class teams in Barcelona and Bayern Munich en route to the finals and they conceded just 18 goals in La Liga – one of the best records on the entire continent. It's very hard to play a scintillating football against this Atletico and they are one of the toughest team to beat in today's football. The Colchoneros have no players missing through injury or suspension and Diego Simeone is likely to select the same XI that started against Celta in their last league match. Midfielders Koke and Augusto Fernandez are in contention to start alongside Gabi in the middle of the park while Antoine Griezmann and Fernando Torres are expected to lead the line. This season, the Colchoneros have already frustrated Real Madrid on two occasions. In October, the first came when Simeone's men snatched a 1-1 draw at the Vicente Calderon, while the second occurred when they beat the Galacticos 1-0 at their own turf. The last four meetings between the sides had witnessed under 2.5 goals. Half of these sides’ last 12 matches have ended level. In 2014, the Madrid rivals met in Lisbon when Carlo Ancelotti's Real Madrid won their 10th Champions League trophy. A Sergio Ramos goal on 93 minutes dashed Atléti’s hopes and sent the game to extra time, where Real Madrid scored three in the last 10 minutes to win 4-1. 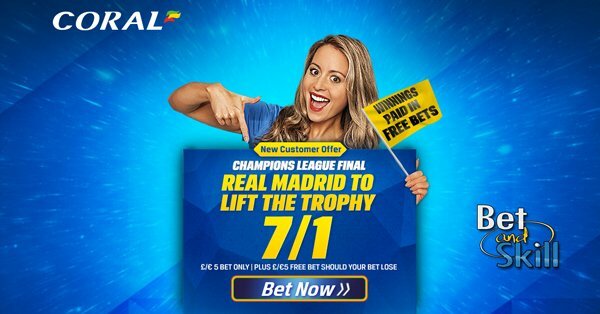 Enhanced odds - 7/1 Real Madrid to lift the trophy + £5 free! Back 11/1 Atletico Madrid to win + £5 free bet! 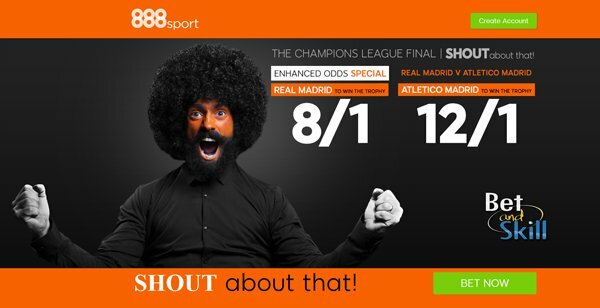 Get 9/1 Real Madrid to win + £5 free bet! Claim 8/1 Cristiano Ronaldo to score + £5 free bet! Double Odds on all first goalscorer bets! Boosted price - 7/1 Cristiano Ronaldo to score anytime! Crazy odds - 8/1 Real Madrid or 12/1 Atletico to lift the trophy! Exclusive offer - 7/1 both teams to score! Double boost! 14/1 Real Madrid or 20/1 Atletico Madrid to win + £100 bonus! Price Boost! 7/1 Real Madrid to beat Atletico Madrid! Enhanced Price: 10/1 Atletico Madrid to beat Real Madrid! "Real Madrid v Atletico Madrid betting preview, predictions, tips, lineups & odds (Champions League final - 28.5.2016)"